Picnic is something you do in style! Therefore in this DIY we will show you how to make your own picnic blanket with the Poly Outdoor fabric from Motiflow. This fabric has a beautifull color intensity and is water-resistant. So: no wet booty’s at your next picnic! • Water-resistant fabric, we choose two pieces of Poly Outdoor fabric (both 150 x 200 cm). But of course it depends on how many people you want on your picnic rug! Or strawberries, or pineapples.. Choose two different prints for the top and bottom side and you can never go wrong! We chose the Poly Outdoor fabric with the summer’s oranges-print from designer Reneesillustrations and for the contrast the beautifull Doodle-dots print by Petitkonijn. But an autumnal print can also be cozy. The Poly Outdoor fabric is just like other Motiflow-fabrics available on 50, 100 and 150cm width. So, you can just as well choose two patterns you like! This way you have everything at hand. So you can start chilling at your blanket as soon as possible! Fold the edges of the fabric around 3 cm, like you see on the right-sided picture. To make it stick, use pins or a clothes-pin. Folded every corner around? Than pin both fabrics on each other, and make sure the prints are on the outside. 4. Sew it and your done! Sew the fabrics on top of each other, with around 1 cm space between the sides and the sewing line. Yay, it's time for a picnic! Make your blanket 'extravagante' by sewing a band for around the picnic blanket. This way the blanket can be easily transported in your bike basket! 😉 You can sew the band the same way as you did with the blanket. We used two pieces of fabric (both 10 x 64 cm). Sew a piece of velcro fastener on the band. How bigger the piece of velcro fastener is, how tighter you can roll or fold up the blanket. We choose the same two pattern for the band as for the blanket, to make it matchy! 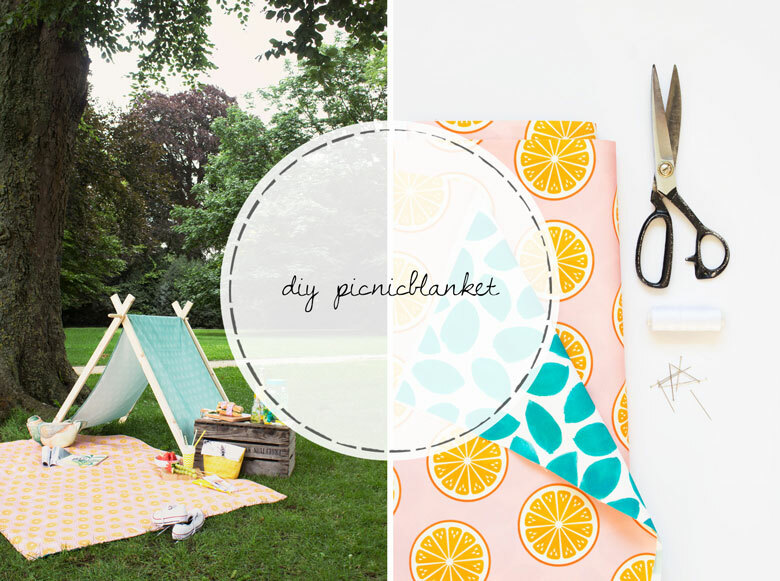 Are you going to make your own picnic blanket? Than share it with the #diymotiflow, she we can like, share and see your creations. Oh.. and don’t forget that you can win two meter of Poly Outdoor fabric this month! Make sure you checkout our give-away.